Michelle has lived in the South Tampa area for all of her life. Her passion for real estate began in 1986 and to further her education she obtained her brokers license in 2013. Michelle is approachable and adaptive working well with all personality types. As a honest and professional entrepreneur, Michelle has owned and operated several companies. Specializing in South Tampa and the gulf beaches, your goals will become hers, with customer service as a top priority. Michelle’s area of expertise has been property management and representing buyers and sellers to achieve their dreams. 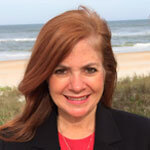 In her free time Michelle is an avid boater who enjoys the beach.